DISCARDED packing tape appears to have brought about the demise of a big crocodile in a central Queensland waterway. The four-metre croc was found on the banks of the Fitzroy River at Rockhampton on Monday. Authorities believe the reptile suffocated. Queensland Parks and Wildlife Service (QPWS) spokesman Joe Adair said rangers who inspected the carcass on Tuesday found blue packing tape looped tightly around its neck. "There was no sign that the animal had been shot or deliberately killed in any other way," Mr Adair said. "It's uncertain how the packing tape got around the crocodile's neck but it's likely that the loop went over its head and tightened around its neck. "This just shows how important it is to dispose of waste responsibly, so it doesn't end up in our waterways and kill native wildlife." 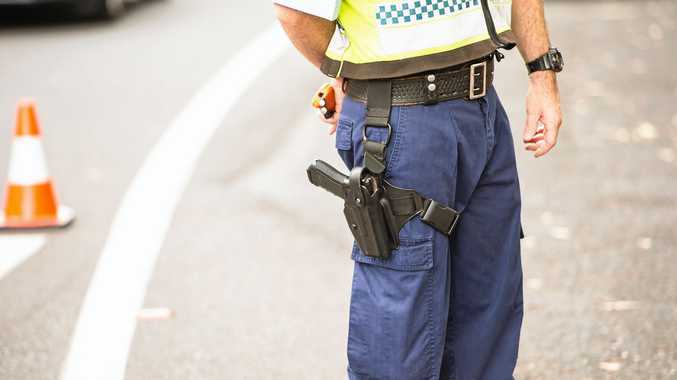 Earlier, a Department of Environment and Resource Management (DERM) spokesman said the find was unusual as the area was "not big croc country". 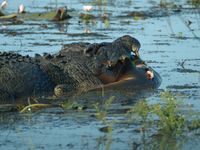 A DERM survey into the abundance of crocodiles in Queensland found there were just 0.04 crocs per kilometre in the Fitzroy River. "Rockhampton is right at the lower end of their natural habitat," the spokesman said. 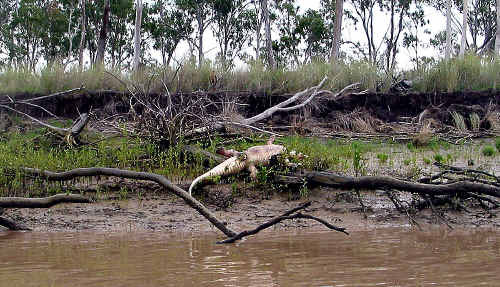 MYSTERY surrounds the death of a large crocodile found belly-up on the banks of the Fitzroy River on Sunday. 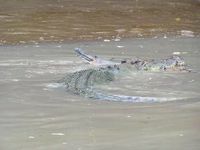 Authorities yesterday confirmed they would investigate what is thought to be the deliberate killing of the four-metre croc, spotted about two kilometres upstream from The Cut Through at Pirate Island. A local sailor, who gave his name only as Paul, yesterday said he was saddened by the sight of the big bloated croc stuck on the riverbank. “It's just so sad,” Paul said. 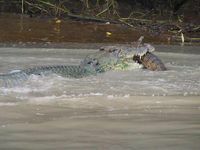 He said after speaking to a few locals on Sunday night, he thought it likely the crocodile had been killed. Paul didn't see any obvious signs the animal had been shot in the head. “It looked bloated and was as stiff as a board,” he said. “He was quite a large croc. He said recent media reports had detailed a problem crocodile at Thompson's Point. But, Paul, who sees plenty of crocs in the river, doesn't believe they pose a big danger. Department of Environment and Resource Management Wildlife Central Team leader Joe Adair said the department would investigate the death. The department currently has no crocodiles of concern in the Fitzroy River. 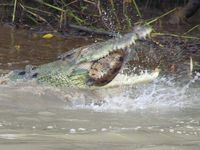 A report into the distribution and abundance of crocodiles in Queensland found a “relative density” of 0.04 crocs per kilometre.